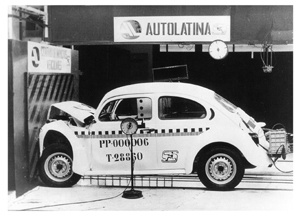 Introduced in Germany in 1936, the Volkswagen Beetle, originally just called the Volkswagen, is one of the most durable and remarkable cars in history. In 1934, Ferdinand Porsche, then a Daimler-Benz designer in Stuggart, began to develop a small, inexpensive "Volkswagen" (or "people's car"). Small-volume production began two years later. 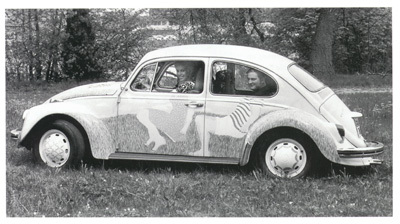 In 1938, a revised model, the KDF Wagen, "Kraft Durch Freude" ("strength through joy"), was introduced. 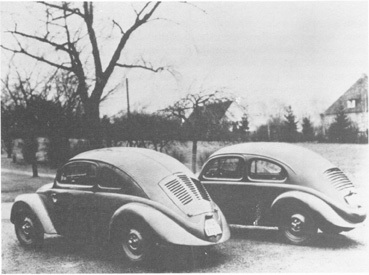 The rear-engine VW was noted for its continuous mechanical improvements while maintaining the same basic styling. The Volkswagen was introduced to the United States in 1949. The press immediately criticized the car as being "too small and too ugly" and predicted that it would be a complete flop. Counter to all expectations, the Beetle was a run-away hit. It convinced Americans to consider purchasing imported automobiles, a previously inconceivable option, and by 1973 it had become the most popular car ever produced, outselling even Henry Ford's Model T.
1977 was the last year that the Beetle sedan was available in the United States; 1979 the final year for the convertible. 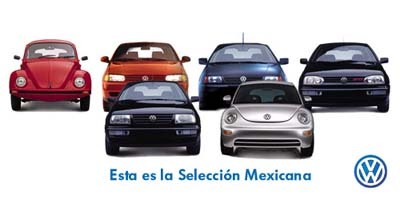 The original Beetle is still manufactured in Mexico. It has been updated to meet modern safety standards and is available throughout South America and Europe.